I appreciate we have done single decks in Zone 1 before but we now appear to be in a different world. Yes there are routes with very strong suburban sections where it would be madness to convert to single deckers. However there seems to be a real crisis on some routes where demand is so low that single deckers could work. I also think some full size single deckers might be easier to "jazz up" in terms of a nicer interior design and may well be perceived as safer and easier to use for some sections of society who find double decks a struggle. Which routes are these then because I certainly wouldn't advocate any current Central London double deck route to go single decker. Well as you asked how about the 7, 23, 414 and C2 for starters. All have seen declines in ridership and will have declined again in the last year. C2 was under 4m pass jnys pa last year and will probably drop again. The aim of my *deliberately controversial* suggestion is that something vastly better for the passenger is put in place. Yes there may be times when things are difficult capacity wise these routes don't stretch that far out beyond Zone 2 nor do they have any very intensive corridors to follow. I'd be tempted to suggest the 172 but I recognise the Old Kent Road and New Cross can cause nightmareish situations for loadings at a drop of a hat, ditto serving Waterloo in the peaks. And don't worry I wouldn't put lots of posh single deckers into Brixton either. But wouldn't you rather decrease their frequencies to cater for their declining ridership instead of converting them to SDs? I don't see their ridership declining to the extent of justifying an SD conversion. Seeing as some of these routes might be modified in some way in the near future perhaps their ridership will consequently pick up again, until then they can have a temporary frequency decrease. The problem with decreasing frequency is that at some point you worsen an already declining situation. People have "tipping points" at which they decide that the service being offered and operated is no longer what they want. They therefore stop travelling on that route and possibly desert buses altogether. There *will* come a point at which TfL's tinkering becomes a more serious issue and starts having material impacts on people and they decide they've had enough. I accept I'm being a bit provocative here but isn't putting very high spec, nice looking buses on these more marginal routes at least an alternative worth considering? I want to see 2016/17's route level data and then we can see just how bad things are. TfL themselves seem to be in a state of shock given their comment about usage before lower much earlier than expected. This suggests an accelerating rate of decline. I don't get into the West End very much but I was really quite surprised how badly used so many routes were when I popped in last week. As I haven't been there for months I can see the difference more starkly than if I was there every day. I agree some routes might be modified. I suspect just about every route in Zone 1 is going to be "altered" in some way. Whether those "alterations" prove to be right is what will determine the future of the core of the bus network. I've no expectation that TfL will abandon the use of double decks in central London but that may simply mean that an awful of seats get propelled through Central London with no one sitting on them. As you know from my witterings I've long been of the view that TfL needed to take on board and use the very best practice from deregulated operators to keep the network attractive and respond to changing demands. They haven't done it and, in part, that's why they're in a mess. It's far from the only reason for decline before people trog and state the obvious but it may have helped keep people using buses and pulled in some punters. Which bits of TfL have wifi coverage? - yep Tube and Overground stations. Buses - nope. Which bits of TfL have air con or cooling - yep some Tube lines and stations plus a lot of the Overground. Buses - oh we buy 1,000 buses that roast you alive . Bit of a no brainer isn't it why people have swapped modes in some cases (ignoring the higher speed / frequency and fast journey times of rail modes). the NB4L fan club doesn't need to chime in here and start arguing. Agree to differ and all that. Except that they don't roast you alive do they? That's true, but not exactly enticing either. Need to go back to basics, is TfL trying to operate an attractive bus network, or is it a basic network to fill in the bits faster trains, tube and trams don't do. The public is clearly voting with their feet for latter, journey time wins. Simple question is, do you try and make buses more luxurious and attractive or do you accept that people prefer speed. Look at any bus, some won't sit so don't care how good the seats are, upgrading them won't attract more people like that. TfL can't afford new electric buses by 2025 (like Paris). Electric buses are quiet and seen as enviromentally friendly, diesel (and hybrid) are seen as noisy and polluting and often rattly. We are approaching £2m per day subsidy for a network that people are deserting, dabbling won't help, it's a big change needed or nothing. Whilst electric buses are great I'm not sure that they are going to attract more people onto buses? I don't see how converting any Central London routes to single deckers is going to help the situation either. I didn't explain myself well. If you loose the commuters, the expensive off peak (strictly low additional revenue compared to cost of operating) means that doesn't need big buses either. It's madness to have double decks off peak but there is a lack of them at the moment in central London. Remember that the total capacity of a Citaro-K is similar to a LT (and start stop is now available so probably not banned anymore for new orders). Double decks on premium provincial routes work because everyone gets a comfy seat and doesn't have a train as competition. No I don't see that argument at all, people are at risk of being catapulted down the bus due to rapid acceleration on single deckers as well, the risk of injury is slightly higher on a double decker perhaps but nobody is going to be fooled into thinking that they are going faster than they actually are. Buses constantly being held to regulate the service is the main problem in London and electric buses won't solve that. We've had single deckers various guises in London and I think it's fair to say that they've not been a success, crush loadings are not going to entice anybody back onto buses when they can go from door to door in comfort with uber. There are routes in Central London that can be converted to single deck. I would rather keep the routes and links and compromise with smaller more environmentally friendly buses. In addition to the 7,414,& C2 I'd suggest the 452, 211 and maybe the 22 & perhaps one of the 28/31/328 routes. I travelled on a 328 recently off peak mid week and I was the only passenger sitting upstairs between Harrow Rd and West Hampstead. The fact is, sadly, passenger levels are dropping on some routes quite drastically. 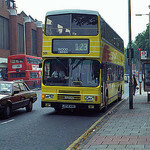 Whereas, on routes like the 75 , people are left behind at school times because the service isn't frequent enough. I'd really hope to see some actual improvement in Inner London bus routes that desperately need more buses at the expense of running empty buses into Central London that just get curtailed due to roadworks , which loses their appeal totally. A lot of routes struggle at school times. I think the main reasons bus usage is falling is because TfL have some on street competition in the shape of uber and a lot more people are cycling which surely has to be a good thing? I don't really see how converting any routes to single deckers will do anything to redress that? I suspect London Overground is a significant factor in the decline on the 28,31 and 328? I'd like to see resources saved in Central London redeployed on some more orbital express routes like the X26, I don't suppose that route has suffered any decline in patronage? Apparently at the Belgium bus show both RATP and Big Bus had electric open top tourist buses for Paris on display. I wonder if we will now (by 8 April 19 when earlier ULEZ comes in) see electric tourist buses for London to replace some of the aging diesel buses. I remember reading an article somewhere saying RATP are looking at bringing electric tourist buses to London. The benefit of long term strategic funding and a long term funding settlement. It's why stuff gets built and put into service in Paris and Ile de France. They make us look like rank amateurs.